The Guys was presented as a partial fundraiser in support of the National Fallen Firefighters Foundation. In cooperation with the Delhi Township Fire Department, a total of $410.18 was raised and sent to the NFFF. In The Guys, Nick (Rick Dethlefsen), a fire captain who has lost most of his company in the Towers on 9/11, must now come up with words of comfort for the families of his men. Joan (LeAnn Dethlefsen), a New York writer who is desperate to find a way to be useful in the aftermath, helps Nick put words to the love and admiration he feels for his men, and helps Nick to paint a picture of the guys as they were in life, hanging around the firehouse with their company. 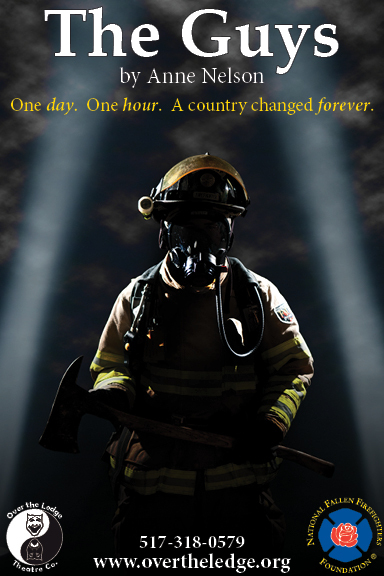 The Guys is a touching story that aims to focus on the human rather than the heroic side of the firefighting men and women who gave their lives on that day.